It´s not been more than merely a couple of days since the first ones started pouring in and we are already flooded by a deluge of consistently negative reviews of GLASS intermingled with a bunch of limply lukewarm ones which makes you wonder, just exactly what movie did all these people think they were watching? Firstly, it is an M. Night Shyamalan film. Secondly, it is, indeed, a sequel to the filmmaker’s own Unbreakable (2000) and Split (2016). And lastly, didn´t really anyone watch any trailers whatsoever? Repeatedly reading pieces on how the movie fails to deliver on promises of grandiose carnage and spectacle and how making it through its unbearably boring second act is nothing short of plodding torture is, to me, flat out flabbergasting. Context, in this case, will turn out to be both GLASS’s lifeline and downfall since, similarly to last year’s Infinity War, it is near impossible to make heads or tails out of it without the benefit of having watched the previous entries in the unexpected trilogy. And such context tells us to expect nothing other than the classic tropes ever-present all throughout the oeuvre of the erstwhile Spielberg heir apparent. Shyamalan has always used the finest of points to, eventually, get across the broadest strokes. Regardless of the stories he’s chosen to tell so far, he is, if nothing else, an elegant storyteller and a firm believer in the idea of things imagined being way more effective than those witnessed first-hand. Whether that works for you or not is an entirely different matter but the point of getting enraged at the scorpion for stinging the frog is entirely moot. The plot concerns the three superhero-comic-inspired characters ending up locked up in a mental health care facility under the close supervision of Dr. Ellie Staple, a psychologist specialized on the treatment for individuals who believe themselves to be superhumans (the aforementioned broad strokes) played with her by now trademarked blend of compassion, pity and condescension by Sarah Paulson. This is, indeed, the bulk of the movie, bookended by a way-too-brief initial act and an even more fleeting denouement and your eventual enjoyment of the movie at large will thoroughly depend on how you feel about it. The story picks up a couple of years after the events depicted in Split and almost two decades after those in Unbreakable, and from the start it becomes evident the director’s commitment to keeping and respecting continuity: besides returning stars Willis, Jackson and McAvoy (as David Dunn, Elijah Price and Kevin Wendell Crumb- and his grocery store-list-long cast of aliases-, respectively) we are treated to solidly welcome turns by Spencer Treat Clark (as Joseph Dunn, now playing Micro to his father’s Punisher), Charlayne Woodard (as Mrs. Price), and Anya Taylor-Joy (as Casey Cooke; only Robin Wright is notably absent, replaced by a stand-in’s back in a flashback) and just like Split worked as a camouflaged follow-up to Dunn’s journey into self-discovery these latter three characters work as the stealth genuine protagonists in this last chapter. Shyamalan himself reprises the part he originated with his cameo in the original and even the score, from West Dylan Thordson (I, Tonya, Joy, Foxcatcher, Split) includes interludes from James Newton Howard’s original Unbreakable score to make you feel more at home. However, expecting either the villain or the hero from Unbreakable to take back the center stage will prove fruitless; Jackson spends a huge amount of his already scarce screentime playing catatonic and Willis’s part- a grizzled widower/ mysterious vigilante alternately known as either The Tip-Toe Man or The Overseer- amounts to barely little more than a glorified cameo, the sum of all of his lines probably easy to fit into, maybe, one page of script. The real, undisputed star of this movie is, once again, McAvoy, who gets thrown all sorts of acting-workshop curveballs which he, in turn, proceeds to vigorously chew on and spit out seemingly without the slightest effort, making his portrayals of Patricia, Dennis, Hedwig, Barry, Heinrich, Jade, Ian, Mary Reynolds, Norma, Jalin, Kat, B.T., Mr. Pritchard, Felida, Luke, Goddard, Samuel, Polly and, of course, The Beast as memorable as regrettably brief. Calling it a tour de force comes off as hyperbolically lazy but this performance coming out a mere four days before the Oscar nominations are officially announced is the greatest double reminder of how he was, in fact, robbed of such recognition two years ago and will, undoubtedly and offensively, be snubbed again one year from now. Perhaps unsurprisingly, given the hints we were able to glimpse since the comments on comic-book tropes offered by both Elijah and his mother twenty years ago, the screenplay takes a deep, deep dive into Lady in the Water territory, wholeheartedly suffusing the proceedings with a meta layer that spells out the finer (?) points of the story for anyone not that well instructed in movie cliches- either superhero or Shyamalan’s. 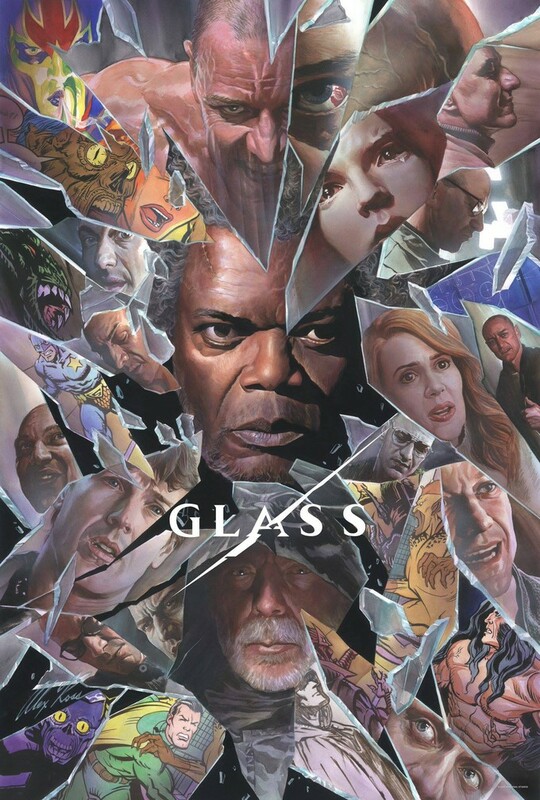 The pace is most definitely leisurely but GLASS doesn´t commit one single sin either Unbreakable or Split were not guilty of themselves and if these movies keep being labeled as superhero films it should be only because of the theme rather than content. This slow descent into disbelief and doubt the main trio undergo is told with his usual sure-handed verve, relying on witty, oblique imagery to portray otherwise trite scenarios and on his cast’s capacity to bring to heartfelt life his, for moments, detachment-prone screenplay. The tone, contrary to widespread speculation that aimed for the beginning of a more restrained shared universe to counterbalance the MCU’s continuously orgiastic Sturm und Drang, is, on the contrary, elegiac and if I failed to see the ending coming it had nothing to do with last-second twists but with a filmmaker’s very conscious decision to deride any potential promises of commercial Nirvana and instead embrace total darkness before dispelling it with the absolute brightness of a climax that feels as sincere as unexpectedly rousing. The little action there is, coming from the director of Signs (a movie depicting a worldwide alien invasion with almost nary a display of grandiosity other than the shadow of a hand under a closed door), ends up being shockingly explicit yet reined in by the acutely marked idiosyncrasy of an auteur adamant on his decision to distinctly differentiate himself from an industry crammed full with myriad of competent albeit undistinguishable peers. The editing by Luke Ciarrocchi (his go-to choice throughout his Blumhouse days) and veteran Blu Murray adapts itself to the helmer’s usual stylistic choices with few and purposeful cuts that allow us to feel in the place, in the moment. GLASS is a worthy cap to one of the most unusual, surprising movie trilogies ever and is, also, undeniably Shyamalan. If the movies encompassed by this statement don´t really do it for you, just skip it. Otherwise, this one will, in turns, entertain you, thrill you, make you feel, etcetera.